Home SharperIron Forums Principles & Consequences Front page article archive Why Do (Some) Seminaries Still Require the Biblical Languages? Why Do (Some) Seminaries Still Require the Biblical Languages? The following is reprinted with permission from Paraklesis, a publication of Baptist Bible Seminary. The article first appeared in the Summer ‘09 issue. Why learn Hebrew and Greek? I want to address just one facet of the question in this essay. The primary purpose of Baptist Bible Seminary is to train pastors. We have made a deliberate choice to focus on only one narrow slice of graduate-level biblical-theological education. I am thinking first and foremost of the pastor when I think of the place of the biblical languages in the curriculum. In its biblical portrait, the central focus in pastoral ministry is the public proclamation of the Word of God. There are certainly other aspects of pastoral ministry, but it can be no less than preaching if it is to be a biblical pastoral ministry. How does preaching relate to the biblical languages? As those who stand in the pulpit and open the Word of God to a local congregation, pastors have the same charge as that with which Paul charged Timothy: “Preach the Word” (2 Tim 4:2). That is an awesome responsibility. The apostle Peter reminds us that “if anyone speaks, he should do it as one speaking the very words of God” (1 Pet 4:11). The Word of God is a most precious treasure—equal to our very salvation in worth, for if we had no Bible we would know nothing of God’s Son, the forgiveness that His cross-work provided, and the new covenant relationship which that work inaugurated. Although the Word of God has been given for all, the pastor is entrusted with the Word of God in a special sense due to his primary responsibility of proclaiming that Word to a congregation. Handling the Word of God correctly is an enormous responsibility. As James exhorted his hearers, “Not many of you should presume to be teachers, my brothers, because you know that we who teach will be judged more strictly” (James 3:1). Preaching is directly influenced by our theology. If we really believe, not just as a matter of academic statement, but as genuine convictions, that the Bible is God’s revealed truth, inspired and inerrant in the originals, then our preaching and teaching of that revelatory corpus must, of necessity, be based on our careful study of the text in the original languages. There is no other way to have the immediate confidence necessary to undergird our proclamation of “thus says the Lord.” If you cannot read the Old Testament in Hebrew and the New Testament in Greek, you will always be at the mercy of those who claim to to be able to do so. The pastor may never become a scholar in the languages, but he absolutely must learn to understand the text as God saw fit to have it written. He must learn to read the text, use a lexicon, and evaluate and profit from the commentaries and grammars. He cannot depend on software to do this for him. Yes, any of the decent language-based software tools will parse every word for you, but if you don’t know what to do with that information, what good is it? There is a world of difference between pieces, even mountains, of data and comprehension. 1 Between Two Worlds: The Art of Preaching in the Twentieth Century (Grand Rapids: Eerdmans, 1982), 15. 2 The Reformed Pastor, edited and abridged by Jay Green (Grand Rapids: Sovereign Grace, 1971), 17. Dr. Rodney Decker has served as Professor of Greek and New Testament at Baptist Bible Seminary since 1996. He has published several books and scholarly articles. He also edits and maintains NTResources.com and has created several specialized TrueType fonts for Greek. ... but why use the Annihilationist, Stott, to lament the low state of preaching? It would seem that Stott is a prime example, no matter how well he writes or how eloquent he sounds? I actually think that there are a lot of good preachers in Independent Baptist circles. And for all my laments about the thinking and direction of many younger fundamentalists, I don't have much complaints about their preaching. I am quite pleased with the kind of preaching coming from these young men. Thank you, Dr. Decker. Such words are not to be gainsaid. There are many things in ministry that can happen without the original languages. But if a man desires a ministry that fleshes out the inspiration of Scripture, which are sheathed in Greek and Hebrew, he will have to not only obtain the facility to understand Greek and Hebrew, but how to use them in preaching. [quote]I have some serious concerns about the state of the pulpit these days. My concern could be stated fairly well by adapting the wording of 1 Sam. 3:1 and suggesting that biblical preaching is rare in our day, and a word from God is infrequently heard from our pulpits. Some of today's best known preachers echo the same sentiment. John Stott, for example, says that "true Christian preaching...is extremely rare in today's Church." This is condesending drivel. "I, even I, only remain, one prophet of the Lord." There are fine, well trained pastors all across our land. Check out sermon audio sometime for a sampling. Yes, there are poor preachers out there. I would guess about the same percentage as there are poor seminary profs. In proportion then as we value the gospel, let us zealously hold to the languages. For it was not without purpose that God caused his Scriptures to be set down in these two languages alone--the Old Testament in Hebrew, the New in Greek. Now if God did not despise them but chose them above all others for his word, then we too ought to honor them above all others. A Christian teacher who is to expound the Scriptures must know Greek and Hebrew in addition to Latin. Otherwise, it is impossible to avoid constant stumbling; indeed, there are plenty of problems to work out even when one is well versed in the languages. There is a vast difference therefore between a simple preacher of the faith and a person who expounds Scripture, or, as St. Paul puts it, a prophet. A simple preacher (it is true) has so many clear passages and texts available through translations that he can know and teach Christ, lead a holy life, and preach to others. But when it comes to interpreting Scripture, and working with it on your own, and disputing with those who cite it incorrectly, he is unequal to the task; that cannot be done without languages. Now there must always be such prophets in the Christian church who can dig into Scripture, expound it, and carry on disputations. A saintly life and right doctrine are not enough. Hence languages are absolutely and altogether necessary in the Christian church, as are the prophets or interpreters; although it is not necessary that every Christian or every preacher be such a prophet, as St. Paul points out in I Corinthians 12 and Ephesians 4. I have some serious concerns about the state of the pulpit these days. My concern could be stated fairly well by adapting the wording of 1 Sam. 3:1 and suggesting that biblical preaching is rare in our day, and a word from God is infrequently heard from our pulpits. Some of today's best known preachers echo the same sentiment. John Stott, for example, says that "true Christian preaching...is extremely rare in today's Church." A bit strong there, Donn! He said "infrequently heard" not "I alone." I'll concede that there's a bit of hyperbole there, though. I only wish it were condescending drivel. If he is talking about broader "Christian" churches, his statement is accurate and not even slightly hyperbolic. I don't know how many churches are in America or what percent are faithfully preaching the Bible, but based on my experience those that truly preach the word are beyond rare. There's no need to go on the defensive here. I don't think there is cause to interpret this as a polemic against fundamentalist preaching. Would you not agree that in the grand scheme of the American church true biblical preaching is rare? So, does adhering to annihiliationism make one a heretic? If not, is annihilationism a Biblical separation issue? I see little difference between annihilationism and, say, evolution. (For instance, neither issue appears to directly touch the gospel message itself i.e. the virgin birth and deity of Jesus Christ, His substitutonary atonement and resurrection, the gospel's exclusivity) why does an "evangelical evolutionist" like Francis Collins engender far more evangelical and fundamental opposition than Stott and they many other annihiliationists? Then again ... this is probably not the appropriate forum for this discussion, which deals with the worthy topic of exegesis in preaching. I stand with Decker, Luther and Charlie on this one!! Not a Stott fan (anymore) and never was a Wright fan, but Stott wrote a very helpful book about preaching and, apparently, being mixed up about eternal judgment (no small matter!) doesn't render him all mixed up about preaching. Perhaps the same is true for Wright, though I have not read him on that subject. Charlie, you beat me to it. I was going to post Martin Luther: The Importance of the Biblical Languages early today, but Sharper Iron crashed. I didn't know that you had to recite Hebrew or Greek to save anyone's soul...for that matter, I didn't know I could save anyone's soul. That must be hidden in the Hebrew or Greek somewhere! Based on what's been said so far, should I step down as a Sunday School teacher because I do not know Hebrew or Greek....or Latin? If a pastor cannot effectively preach without knowing the languages, how can a teacher stand in front of a class and teach effectively? I have to think this was taken a bit too far. I would not say that you should step down from being a Sunday School teacher because you do not know Hebrew, Greek or Latin. I would say that, like all teachers, you will face a strict accountability for all that you teach (James 3:1). Hopefully you have a pastor who knows Hebrew and Greek (probably not Latin in most Baptist or Bible churches) who is faithfully feeding you from God's Word so that you are growing in your own ability to teach others (2 Tim. 2:2). On the other hand, if someone is pursuing vocational ministry where his life's work will be to teach others the Word of God and he aspires to a place of authority where others may give weight to what he has to say, I would see very little reason or possibility for him to have an excuse not to learn Hebrew and Greek. I think that we as fundamental baptists at least have quite a ways to go before we can be accused of taking this point "a bit too far." Pastors in most Protestant denominations (conservative and liberal), pound for pound, would blow us away on a standardized test of Hebrew and Greek, yet we claim to be much more serious about the Bible than they are. I know personally of a situation where an evangelist came through a full-fledged fundamental baptist church recently and preached complete heresy about the nature of God -- to a rousing chorus of "Amens." "My brethren, these things ought not to be so" (James 3:10). Yes, but we aren't discussing Stott's article, we are discussing Decker's article. And Decker uses a seriously flawed preacher to make a point about the scarcity of good preaching. In my opinion, someone who denies a clear teaching of the Bible (and, more specifically of the Lord Jesus himself) is an example of bad preaching, not one to bolster the argument about the lack of good preaching. It just seems like he is an ODD fellow to quote in order to make that point. Part of what teachers of Greek and Hebrew forget sometimes is that we have such abundant resources to help those who have not studied the languages get things straight in their preaching and teaching. My own angle on it is this: it's about leadership. You can do pretty well if you understand basic grammatical concepts, have a solid theological foundation and a really good grasp of sound hermeneutical principles then consult good commentaries, etc. But each generation needs at least a subset of men who are going not getting their exegetical information second hand, but rather from first hand study of the text in its original language. To use a not very good analogy, you can learn to cook from just about anybody--or from some books--but if you want to learn to be a gourmet chef? Then you want someone who has been doing it himself/herself for years. So there are good pastor-teachers who never learned much Greek or Hebrew, but these men are not in a good position to teach future pastors and teachers because now you're talking third-hand exegetical skill. Third hand would be OK where first hand is not available, but it is available. Bottom line: pastor-teachers who do not study Greek and Hebrew in preparation for their work should be the exception rather than the rule. I think some exceptions should exist, and some of the exceptions we have are exactly as they should be. But, generally, first hand skill in the Word should be the norm... and it isn't. Formal agreement on a point does equate to complete agreement on all issues. That is why I can quote and refer people to N.T. Wright in post #8 with a clear conscience. The alternative is using a "fundamentalist disclaimer" at every turn in the discussion where we mention a person or idea. The rest of the world -- certainly not the academic world in which Decker lives and moves -- does not operate that way, and I think it would be ridiculous to expect that of a community which is designed to produce "sharper iron." Not an ideal choice, I'll give you that. I'd say though that he doesn't use a "seriously flawed preacher"--he uses a good point in a good book that was written by a seriously flawed preacher. Well, guys, I am obviously not getting my point across. FIRST, I am not against quoting Stott or anyone else for that matter if the occasion warrants it. I have some serious concerns about the state of the pulpit these days. My concern could be stated fairly well by adapting the wording of 1 Sam. 3:1 and suggesting that biblical preaching is rare in our day, and a word from God is infrequently heard from our pulpits. Yeah, sure, we can agree with that concern if we are talking the broader Christian world. It's almost a given. But then FOR SUPPORT he uses a quote that agrees with his point from a guy who is a prime example of "And the word of the Lord was rare in those days" (1 Sam 3.1). The word of the Lord from Stott is rare because he denies the word of the Lord. Surely there are plenty of other "famous preachers" that could be used to make that point. Try Piper, MacArthur, Dever, Mahaney, Mohler, any of the Togetherness boys, and I am sure you can find a quote from them somewhere that is similar to what Stott said. It is just too ironical that he chooses Stott, a man who denies a significant doctrine as support for his point. So, now, after having said the same thing for three posts in a row now... I'll quit. a better question might be why (presumably) some seminaries no longer require biblical languages. seminaries are for training top-level scholars, writers, teachers and preachers. why would anyone think that this level of training would be complete without biblical languages and the historical framework to contextualize them? a church can function entirely on sunday school teachers, but sunday school teachers don't need to go to seminary. christendom needs seminary graduates, but many churches can and do function quite well without them. Probably because Stott's "Between Two Worlds" is one of the classic books on preaching. I get it, Don. In your view, the very point he's trying to make about poor preaching due to lack of attention to the Word is exemplified by Stott, so he shouldn't be quoted in supported of the point. I can see the reasoning there. It's not "This guy has problems so we shouldn't quote him" but "This guy has the very problem we're using him to argue against so we shouldn't quote him in that way." I don't think I disagree, though it's probably not as important to me as it seems to be to you. As Shaffer pointed out, the book is something of a classic, though it isn't really that old. But if I were looking for sources to bolster my case or simply acknowledge, yes, given his departure from orthodoxy on that point--and how that probably impacts his preaching--I think I'd look for someone else. I'm not sure I'd look all that hard though. He probably still preaches quite well 98% of the time. Since, in his annihilationism, you still have God pouring out wrath on sinners in upholding His holiness, it probably usually shows up in preaching in the absence of references to "eternal" punishment. This is a problem, to be sure, but I have to ask myself how often to I specifically mention the eternal nature of sin's penalty? Oh look- there's my hobby horse! I think the lack of classical education at the elementary level is a huge problem. There was a time when every serious student had a decent grasp of Greek and Latin before they graduated, at, like age 15, because it was normal part of the educational process. Focusing on quality education from the ground up that includes basic Greek, Latin- and in Christian schools, Hebrew- would result in a more 'level playing field', with the laity not so dependent on a few experts, and a congregation that is more adept at searching the Scriptures on their own. Ultimately the Holy Spirit leads and guides to truth, and doesn't necessarily require that a person understand the original languages, but that doesn't mean we have to fall off either the Anti-Intellectual or the Elitist cliff, as human nature is so prone to do. There was a time when every serious student had a decent grasp of Greek and Latin before they graduated, at, like age 15, because it was normal part of the educational process. Focusing on quality education from the ground up that includes basic Greek, Latin- and in Christian schools, Hebrew- would result in a more 'level playing field', with the laity not so dependent on a few experts, and a congregation that is more adept at searching the Scriptures on their own. how long ago was this? were there ever any christian middle schools teaching greek and hebrew? why do i even want to know rudimentary greek and hebrew? it seems much more efficient to me to teach good researching skills. i would have to spend a lifetime studying to match the expertise i can find by comparing several english translations and studying with a few good commentaries. a rudimentary grasp of the language gets me nowhere and only possibly into trouble if i think i know more than the experts. Except to say that I don't think Stott's book is all that classic. I have it, read it when it first came out, didn't think it said all that much different from the average book on preaching. The title was great, though. Often, the title is the best thing about books. Personally, I think Bryan Chapell's book, Christ Centered Preaching, is far superior (although I don't like the Reformed orientation, but that is of course a matter of taste). As far as the point of the article, I agree with the general thrust. If possible, young men training for the ministry should have Greek and Hebrew, even if they have to struggle through it and aren't really "language guys". A familiarity with either or both languages is very helpful in "rightly dividing the word". I don't think Classical education, however, is the answer. When Classical education was in vogue, most young men weren't getting an education at all, just those gifted for it, either by social class and position or by ability. The average guy was learning to be a tradesman and barely literate. Chris, it wasn't until the 19th century that Greek and Latin were excised form the curriculum. J. Gresham Machen, for example, deplored the discontinuing of Latin. If you read The Idea of a University by John Henry Newman, you'll find an example of a university interview. To get into, say, Oxford, students would be examined in one Latin work and one Greek work. The tutor would ask them about grammar and syntax, but even more about theme, plot, critical reasoning points, and such. So, education then was familiarity with a set corpus of literature and a facility in reading, writing, and thinking. In the aftermath of Scottish inductivism, American education has followed the trend toward amassing facts and testing quantity of factual knowledge. For that matter, 300 years or so ago, everyone who went to university learned the same thing. There was only one course, the "Bachelor of Arts." You learned "the arts," which are roughly analogous to what we call humanities today. Then, you could get a Master of Arts, an intensive course focusing on logic, philosophy, and research skills. Then you could specialize into law, theology, or medicine, earning, for example, the Bachelor of Divinity. (Of course, I'm generalizing a bit since the exact order of courses varied by century and geography, but this is pretty close to how education went everywhere before the rise of the modern German research university). I want to point out that our quality of ancient language pedagogy has declined sharply. The average contemporary PhD in Theology has nowhere near the facility in Greek that a post-Reformation scholar would have. If you read Philip Melanchthon's works on education, you find him recommending teaching Greek to what we would know as middle and high school students. The courses were conducted in Greek to the extent that the students would understand. The more advanced "high school" students could simply be read to straight out of the NT. So, the pre-university students of Melanchthon's Germany (at least the bright ones) would have a facility in Greek that only a few dozen specialists possess today. Do you know anyone that can speak Koine Greek conversationally? Even in Anne of Green Gables, Anne learns Greek and Latin. If I remember correctly, she likes Latin but not Greek. My point is that we are in a historical wasteland as far as ancient language facility goes. Where Koine is taught at all, it is generally taught as a dead language to be approached through a paradigm-oriented code breaking mentality. Students are taught to perform certain tasks (sentence diagramming, etc. ), but not to learn the language as a real language. There are steps in a more positive direction, however. Randall Buth's Biblical Languages Ulpan offers immersion courses in (spoken!) Koine, and biblicalgreek.org takes a living language approach as well, incorporating classical Greek into the learning process. The ugly truth of the moment, however, is that probably 80%+ of evangelical pastors remember Greek and Hebrew merely as unpleasant educational experiences. That really is a waste of time. The Cultural Life of the American Colonies by Louis B. Wright - which, by the way, explores the fact that in the mid-1700's, there were at least one hundred and twenty-five private schools/tutors that advertised their services in Philadelphia newspapers, offering instruction in Latin, Greek, mathematics, surveying, navigation, accounting, bookkeeping, science, English, and foreign languages. IMO an appreciation and understanding of languages, especially Greek and Latin, is very important to several subjects, such as spelling/vocabulary, classic literature, and science. And why wouldn't someone want to learn Hebrew? I'm not saying that everyone should aim for expertise. To borrow Aaron's cooking analogy- I can open a box and follow the directions- which is IMO how most people treat Bible study and church. Or- I can learn the basic how's and why's of cooking, and not only follow directions but understand why the directions work. Or, if I wish to become a gourmet chef, I can go to cooking school and acquire the desired expertise. No matter which method I use, I can still provide a nutritious meal for my family- but the balance of nutrients and the overall quality is going to be better the more I know about what I am doing. how long ago was this? were there ever any christian middle schools teaching greek and hebrew? I attended a Lutheran high school in the mid-80's where anyone intending to study for the Lutheran ministry needed to take four years of Latin and two years of German in high school. If you were not on that track by your sophomore or junior year, it was almost too late to be "called" to the ministry. The same is still true today in their system, as far as I know. In the Lutheran school system, the major recruiting for the ministry preparation schools was really done in middle school. I am not necessarily recommending that as a model, just saying what is -- or at least what I witnessed in my experience. I can say without hesitation that if you had a Biblical languages contest between a group of fundamental baptist pastors and a group of orthodox Lutheran pastors, the baptists would get embarrassed pretty badly. Teaching Greek and Latin in schools never completely died, I don't think. Even out in the boonies where I live, there's a school down the road doing it. I might teach there a little this fall. But it's still not quite "old school," because you learn Latin in Jr High and Greek in High School (rather than both in elementary). I never got Latin, so I'm hoping for a good excuse to study it a bit down the road. It's really not about being able to "read Greek" in ministry as much as it's about acquiring the tools of thought and thoroughly grasping grammar in general. I would argue that it really is about being able to read Greek. Leaving the isolated and rather idiosyncratic world of "biblical" exegesis for a moment, any foreign language teacher will say that the goal is to internalize the language, to be comfortable thinking and communicating using the language as a medium. What we want to eliminate is the double mediation, in which I look at a French sentence, convert it through the use of memorized rules and paradigms into English, and then understand it in that English equivalent. The goal is to understand the French in French as French without having to process it through an English byway. 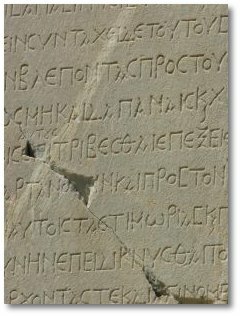 Classics professors such as Carl Conrad the longtime moderator of the B-Greek email list, insist that internalization is the goal for ancient languages as well. The truth is that advanced analysis techniques derived from literary theory only work if you already know the language. They are not substitutes for learning it. People only moderately comfortable in the language who use these tools such as arcing are destined to overestimate the significance of isolated text factors (individual words or tenses) and to underestimate the impact of genre, discourse, and pragmatics. An illuminating example of this is Charles Ryrie's theology of crisis sanctification built upon the "once-for-all" aorist tense of παραστησαι in Rom. 12:1. The issue is not just that Ryrie totally misunderstands the aspective significance of the aorist, but that anyone would attempt to do theology in such an atomistic fashion. The same sort of mistakes occur when pastors try to prove complex theological points from the lexical definition of or even the proposed etymological derivation of a particular word. Another example would be the proof-texting approach in which I make a theology of justification by looking up all the verses containing a δικαι· root and try to add them together. If you can't flop open your GNT and read it pretty decently, no technique or method of analysis is going to make you a skilled exegete. As one excellent BJU professor said, "Exegesis is just reading on a higher level." I personally wish that I'd studied harder in the years that I had Greek at NBBC, and I was the guy beating the 'do we really need Greek when we've got cyber-resources' drum. There have been several times when I've needed advice or wanted to understand a term used in the Bible or in a commentary, and my life would have been made far easier if I had worked harder back then. Logos and Interlinear resources can indeed only carry a person so far. That being said, it's been ten years since Greek (already? ), so I have to understand that I won't retain it all. Because of that, I've been actively looking for something like "Mastering New Testament Greek on CD-ROM: An Interactive Guide for Beginners" or "Greek Tutor" to help me brush up. If anyone has a suggestion, please let me know.